﻿ Jeju Bada Wi Olle Pension, Jeju Island | FROM $36 - SAVE ON AGODA! "The host is warm, kind and helpful." Have a question for Jeju Bada Wi Olle Pension? "Friendly and delicated staff who are always happy to lend a helping hand." 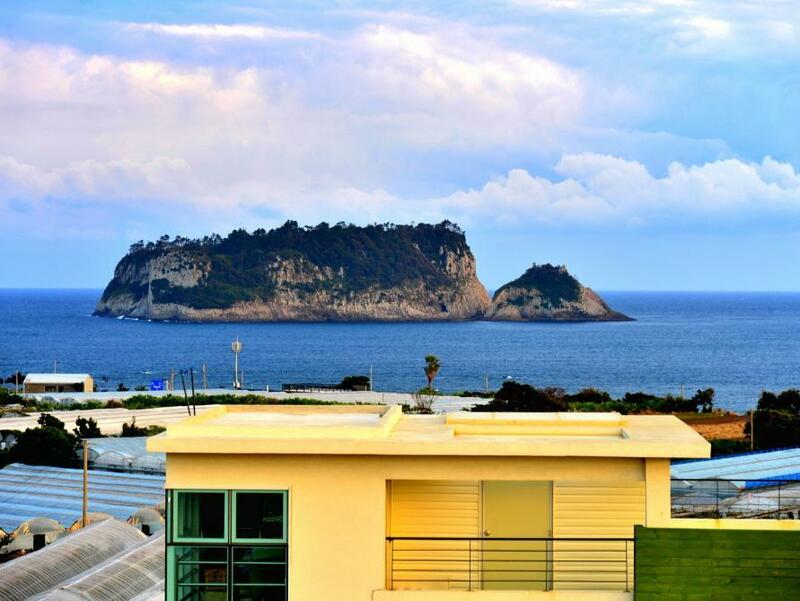 "Ocean view from the room :) The room is fully furnished with kitchen as well." "The kitchen is clean and adequte equipped." "The owners are great hosts." 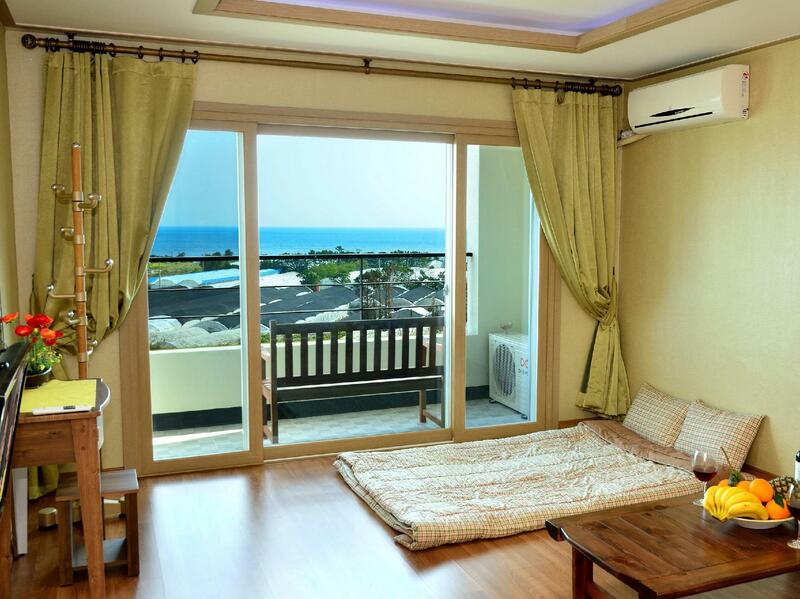 Ideal for fun and relaxation, Jeju Bada Wi Olle Pension is located in the Seogwipo area of Jeju Island. From here, guests can enjoy easy access to all that the lively city has to offer. With its convenient location, the hotel offers easy access to the city's must-see destinations. 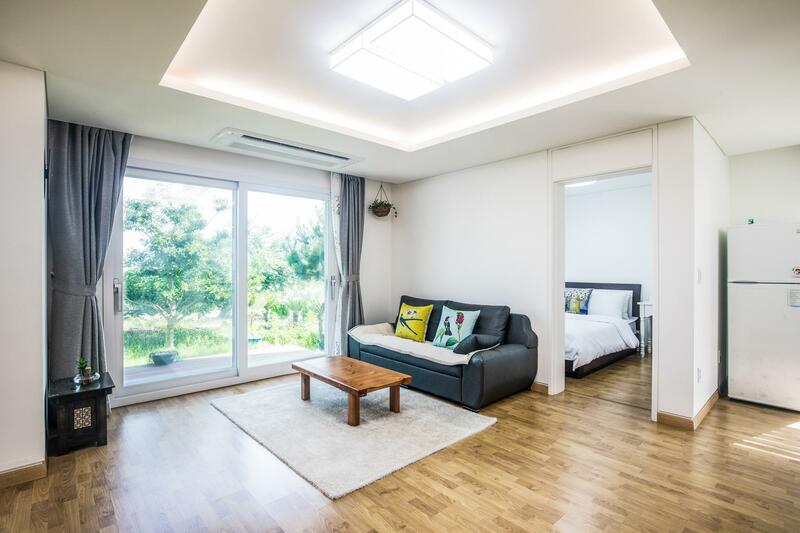 Offering hotel guests superior services and a broad range of amenities, Jeju Bada Wi Olle Pension is committed to ensuring that your stay is as comfortable as possible. While lodging at this wonderful property, guests can enjoy free Wi-Fi in all rooms, luggage storage, Wi-Fi in public areas, car park, family room. Hotel accommodations have been carefully appointed to the highest degree of comfort and convenience. In some of the rooms, guests can find television LCD/plasma screen, mirror, non smoking rooms, air conditioning, heating. Besides, the hotel's host of recreational offerings ensures you have plenty to do during your stay. Jeju Bada Wi Olle Pension is a smart choice for travelers to Jeju Island, offering a relaxed and hassle-free stay every time. 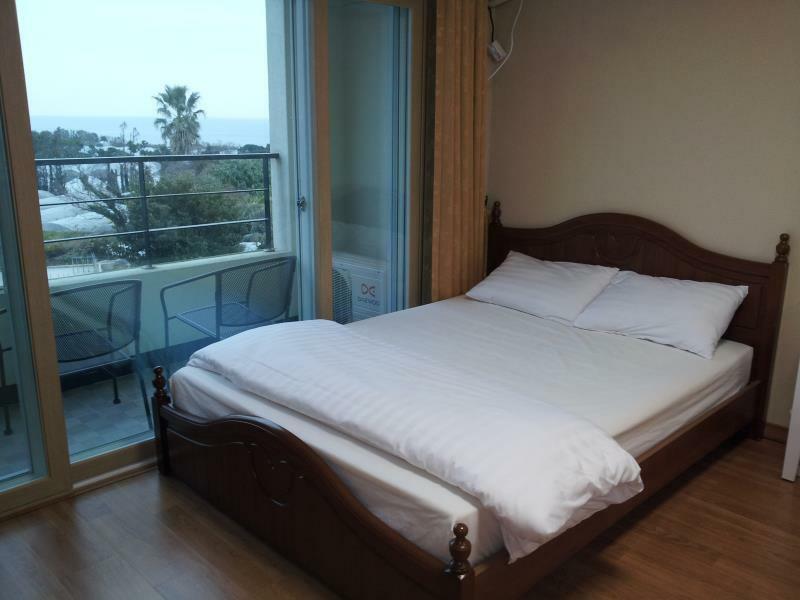 "There is restaurant downstairs and around the hostel and con..."
This is our second time staying at Jeju Bada Wi Olle Pension. Both the first and second experience were amazing. The owners are always warm and hospitable. The room is spacious. The location is convenient. There is a bus stop nearby and an E-Mart and other convenience stores in the area. The Seogwipo Bus Terminal is also nearby. Very very nice place. Their dog, Olle, is so cute and smart. He guided us to the sea near the place. The views in the rooms are also very nice. You can enjoy the sunrise in the morning. We will definitely stay here again the next time we are in Jeju. Jeju Bada Wi Olle Pension is located nicely. The room is cozy and comfortable. The hosts are very friendly and accommodating. We arrived earlier than the check-in time but the owner allowed us to check-in. Check-in and check-out are fast and easy. The view in our room is amazing. I will recommend this place to those who will be going to Jeju. Quiet but not far away from main road. The host is warm, kind and helpful. He gave us very nice gift, the local grown mandarin oranges. The kitchen is clean and adequte equipped. Go to the roof top, you can enjoy seaview and see the sun rise. The host is very nice and the stay was very comfortable. In between Seogwipo and Jeju City, I was deliberate in picking the south so that I could be nearer to the coastal walks. Badawi Olle is the best choice I have made in my whole trip! Not only is it a stone throw away from Olle Trail 7, its wonderful coastal view from the balcony was so a pure bliss every morning. 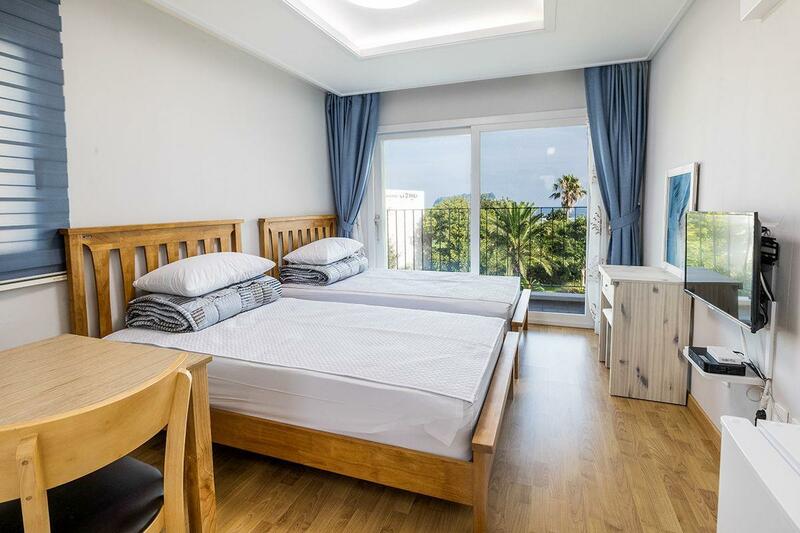 The pension is very close to the bus stops and is greatly accessible via public transport. All the earlier concerns about connectivity were all unfounded. The owners are great hosts. As much as they couldn't converse with me much in English, they tried their best to reach out to me. The wife made fresh tangerine juices and even packed tangerines for me to bring back home. Not to mention, they even had a farewell lunch with me. 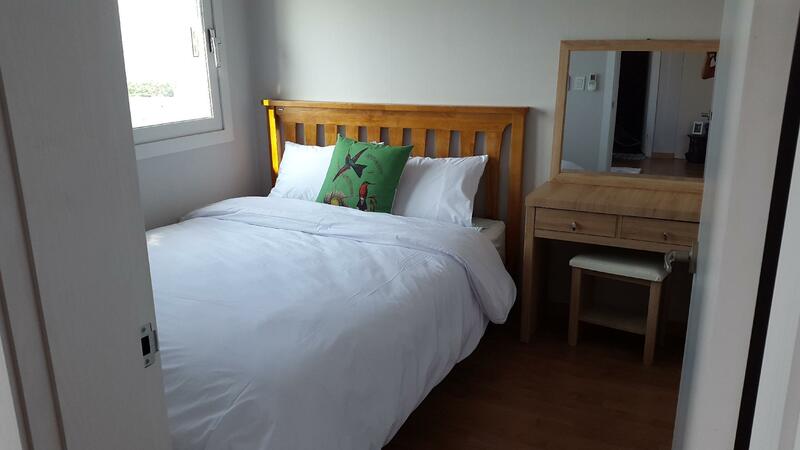 This trip to Jeju is not complete without the stay at Badawi Olle! Very Near to the peak. Within walking distance. There is restaurant downstairs and around the hostel and convenient shop opposite. The host is very nice and the stay was very comfortable. it was a great stay and i give 5 star for overall experience. 1. From Jeju Airport, take Bus 600 Airport Limousine and get off at Seogundo bus stop, walk about 5 mins and you will reach the pension. 2. The owners are very nice and always keeping a smiling face. 3. Ocean view from the room :) The room is fully furnished with kitchen as well. Can buy fresh food, bring back to the room and cook. 4. Quite convenient to get to Seogwipo town centre, just walk out from the pension and take bus 5. We took bus 5 to Seogwipo Maeil Olle Market. The frequency of the bus is 20 mins interval. The pension is near to the seaside while the airport bus 600 is just about 100m away which makes it so convenient. There is a dog raised by them which is so cute and obedient. It waited for us to come back from strolling and kept us company while we walked to the seaside at about 8pm. The landlord lady provided us with a plate full of tangerines when we reached at 10pm at their pension and next day shared the pancake she made for us. Just before a night we were leaving their pension, they invited us with some home cooked food and soju in their small kitchen. We chatted and had fun staying over their. Friendly and delicated staff who are always happy to lend a helping hand. This is our second time to stay at Jeju, the host is very very nice, thanks again for your food, very delicious. Next time will stay again, see you next time. Wish all the best. Despite the absence of an elevator, our host warmly welcomed us (with a young infant and elder). It was difficult to tug our luggages but host even helped us to bring our luggages up despite his age, and had accommodated to our needs. We loved our stay and would love to stay here again. nice hotel with a nice view from the window. Near to the beach which just need to walk approx 500m you will reach the beach side. room is comfortable and clean with the sufficient space. Friendly staff/owner which help us to carried all our luggage upon our arrival and recommended us to a nearby nice black pork restaurant. they also treat us with their own plant tangerine (popular fruits in Jeju) and also the tangerine juices which taste nice!!! Seaview room, friendly owner and studio room. Location is near the world cup stadium and emart. A bit hard to find unless you drive. Good and spacious room with attached kitchen. Friendly owner even make us a orange juice when we left. Owners are very hospitable, enthusiastic, responsible for transport ! I enjoy here every! Owners are very hospitable, enthusiastic, responsible for transport ! I enjoy here every day ! Thanks to Mr. Bang for sending the post card to the post office! Thank you so much ! The pension owner and his wife are friendly and they are always there to welcome us back from our visit around Jeju. He offers us oranges for free and would try to offer advise on the places to eat nearby the pension. We felt as though he is our father, showing concern to their kids (which is us). We do not have any issue locating the pension, thanks to the GPS. The pension is located at a quiet place with good scenery. The room is big and equipped with floor heater. It is well maintained, up to my satisfaction. The television offers much channel selection. There is a washing machine at the ground floor and clothes hanger outside the balcony of the room. Comfortable and warm accommodation. I highly recommend staying at Bada Wi Olle Pension. The owner was nice and gave excellent recommendations for sightseeing and for restaurants. The view, especially at sunrise, is breathtaking. We will definitely stay here again the next time we are in Jeju-do.